Remember in my goals for 2013 I said I wanted to share more awesome fat positive stuff? Well recently I was contacted by a lovely young woman named Katy Russell who had some stickers she wanted to send me. I duly gave her my PO box and a bit later, these gorgeous beauties arrived! Aren’t they brilliant? Katy is a local artist who has decided to create this awesome range of fat positive artworks which she is selling on Redbubble and will have some products on Zazzle too. What do I love about these? I love that she has a variety of body shapes and sizes (the blonde one in the spotty swimsuit is most like my shape!) and she has represented women of colour as well. I love the bright colours, the cute fatshion and the positive representations of fat women. Best of all I love the name, Aerodynamic, which is a play on the idea that aerodynamic must equal thin, when it really equals rounded, smooth surfaces. I’ve seen some of Katy’s artworks crop up on Tumblur (particularly the one on the top right there) but I really do hope to see her work shared far and wide. Prints, stickers and cards are ultra affordable on Redbubble, so I think I’ll have to expand my collection. 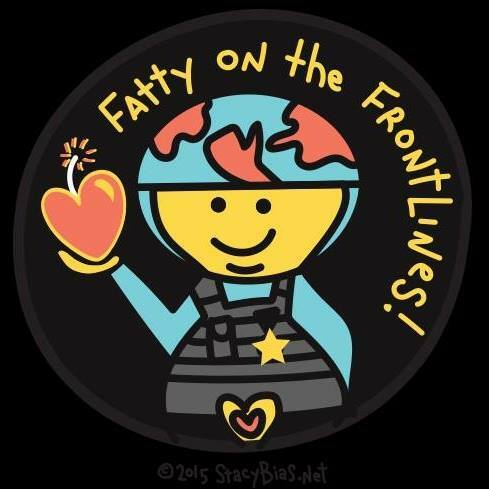 I particularly want to introduce more fat positive art into my home this year, and I love Katy’s work. So go support Katy’s work huh? I think I might have to chat to her about commissioning some artwork for me!